The Association for Africanist Anthropology (AfAA) exists to stimulate, strengthen, and advance anthropology by promoting the study of Africa, as well as Africanist scholarship and the professional interests of Africanist anthropologists both in and outside of the African Continent. 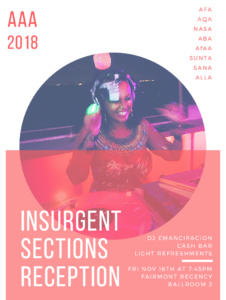 If you are interested in or conduct anthropological research in Africa, we want you to join us in the Association for Africanist Anthropology (AfAA). There are five good reasons to join or renew your membership in AfAA. We offer book and essay awards to distinguished scholars, graduate student members, and undergraduates. As a section of AAA, we review and adjudicate papers and panels for presentation at the meetings. Some people belong to more than one section, but AfAA might be the best place for your work on Africa to be reviewed. AfAA is a great place to network. Come to our reception and business meeting. Dialogue with other Africanists. The membership fee is only $30 a year. 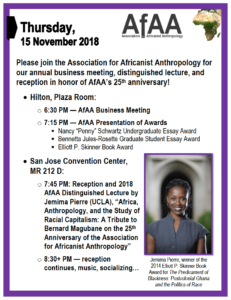 We sponsor a Distinguished Lecture in Africanist Anthropology each year following our reception. Great food is always served with proper African hospitality. We look forward to our upcoming meetings — see you there!